That’s from the obituary of Nobel winning Marie Curie — the only person so far to win a Nobel in two difference Sciences. Things, however, were not always easy for her. 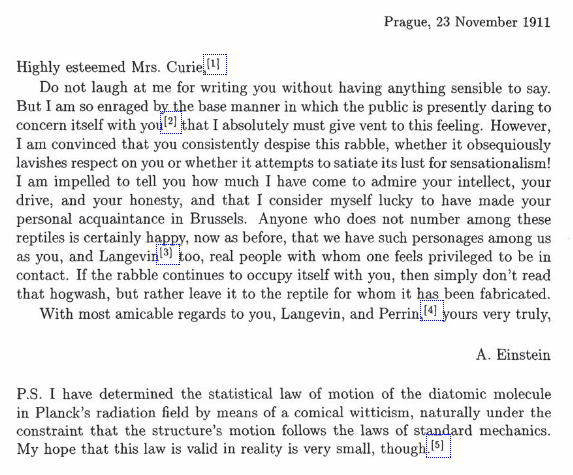 In 1911, Curie was facing relentless attacks on her personal life saying that she “tarnished the good name” of her late husband Pierre Curie. She was denied a seat in the French Academy of Sciences in January 1911 for reasons that probably included gender and religion. Albert Einstein took to the pen and paper and offered her some sage advice that is still relevant today. Not only did Einstein have a big brain, but he had a big heart. The letter is part of nearly 5,000 of his personal papers that can be found online in The Collected Papers of Albert Einstein. Do not laugh at me for writing you without having anything sensible to say. But I am so enraged by the base manner in which the public is presently daring to concern itself with you that I absolutely must give vent to this feeling. However, I am convinced that you consistently despise this rabble, whether it obsequiously lavishes respect on you or whether it attempts to satiate its lust for sensationalism! I am impelled to tell you how much I have come to admire your intellect, your drive, and your honesty, and that I consider myself lucky to have made your personal acquaintance in Brussels. Anyone who does not number among these reptiles is certainly happy, now as before, that we have such personages among us as you, and Langevin too, real people with whom one feels privileged to be in contact. If the rabble continues to occupy itself with you, then simply don’t read that hogwash, but rather leave it to the reptile for whom it has been fabricated. If you’re interested in learning more check out Madame Curie: A Biography.